1) Glory to the śrī-kṛṣṇa-saṅkīrtana, which cleanses the heart of all the dust accumulated for years and extinguishes the fire of conditional life, of repeated birth and death. This saṅkīrtana movement is the prime benediction for humanity at large because it spreads the rays of the benediction moon. It is the life of all transcendental knowledge. It increases the ocean of transcendental bliss, and it enables us to fully taste the nectar for which we are always anxious. 2) O my Lord, Your holy name alone can render all benediction to living beings, and thus You have hundreds and millions of names, like Kṛṣṇa and Govinda. In these transcendental names You have invested all Your transcendental energies. There are not even hard and fast rules for chanting these names. O my Lord, out of kindness You enable us to easily approach You by Your holy names, but I am so unfortunate that I have no attraction for them. 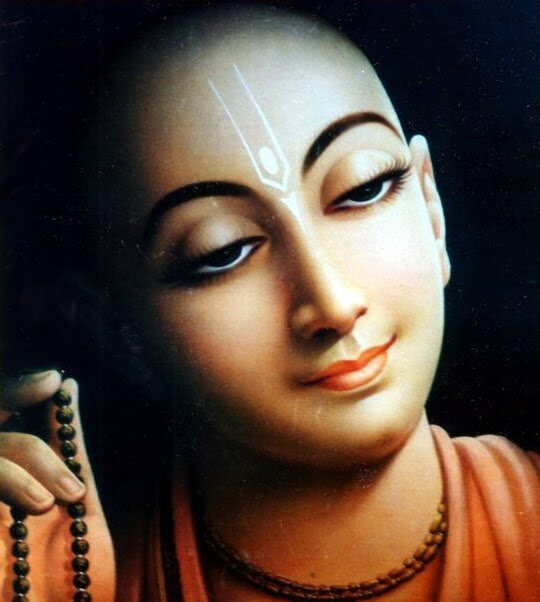 3) One should chant the holy name of the Lord in a humble state of mind, thinking oneself lower than the straw in the street; one should be more tolerant than a tree, devoid of all sense of false prestige, and should be ready to offer all respect to others. In such a state of mind one can chant the holy name of the Lord constantly. 4) O almighty Lord, I have no desire to accumulate wealth, nor do I desire beautiful women, nor do I want any number of followers. I only want Your causeless devotional service, birth after birth. 5) O son of Mahārāja Nanda [Kṛṣṇa], I am Your eternal servitor, yet somehow or other I have fallen into the ocean of birth and death. Please pick me up from this ocean of death and place me as one of the atoms at Your lotus feet. 6) O my Lord, when will my eyes be decorated with tears of love flowing constantly when I chant Your holy name? When will my voice choke up, and when will the hairs of my body stand on end at the recitation of Your name? 7) O Govinda! Feeling Your separation, I am considering a moment to be like twelve years or more. Tears are flowing from my eyes like torrents of rain, and I am feeling all vacant in the world in Your absence. 8) I know no one but Kṛṣṇa as my Lord, and He shall remain so even if He handles me roughly by His embrace or makes me brokenhearted by not being present before me. He is completely free to do anything and everything, for He is always my worshipful Lord, unconditionally.